The capital of Goa and headquarters of North Goa District, a small a charming city on the left bank of silvery Mandovi River, with beautiful red-roofed houses, built in Latin style, also boasts of many modern houses, well laid garden, statues and avenue's lined with Gulmohar, Acassia and other trees. The Portuguese heritage of the city will present itself before you as you make your way through the remarkably well preserved narrow winding streets, old houses with overhanging balconies and numerous small cafes and bars. You will also get the Portuguese touch in dress and lifestyle of the local people. Other than exploring the Portuguese legacy, Panaji will also throw open for you numerous other options to enjoy yourself. It is the cultural capital of the state and as such provides you an opportunity to stir your soul with performances of local artists. Also, since the city of Panaji is netted, as if in a spider's net, with the network of waterways, river cruises are quiet an activity to enjoy. At one point of time, Panaji was the fishermen's habitat and hence the fish market of the town provides a visual impact in itself. The colourful fishes caught by the fishermen are sold here. Altinho (pronounced as Aal-teenyu) is a hill located at the centre of the Panji, soaring high from the river and sea fronts. Originally Altinho was a long ridge called Oiteiro de Conceicao (Hill of Conception) and today it looks like two hills separated by a road known as Corte de Oiteiro. In Altinho you can see the bungalows of government ministers, bureaucrats, the Bishop's Palace and houses belonging to some of Goa's oldest families. The tree-lined heights and quiet winding lanes add more to the beauty of Altinho. You can get breathtaking views of the capital city Panaji and its waterfront from the Altinho hill. Built in 1894, the Bishop's Palace has twelve crosses commemorating the Stations of the Cross, tracing Jesus Christ's walk up Calvary to his crucification. If you visit Goa on Christmas, you must attend the open-air Christmas Mass in the courtyard of this palace. A larger-than-life size statue of Jesus Christ holds his arms out towards the congregation and lanterns strung up in the trees. At the stroke of midnight on 25th December the celebration begins. Jogger's Park lies close to the Altinho Hill and it provides even better view of the Panaji town. Two main roads leading away from Jogger's Park, one road takes you to Bhatlem and Mala and the another road will take you to Kala Academy and Campal. From Jogger's Park a short walk down the road takes you to the Boca de Vaca Spring. The cow shaped spring, Boca de Vaca is known for its clear and sweet waters. The local people still use the water for drinking. Mahalaxmi Temple is located next to the Boca de Vaca Spring. Built in 1818, the Mahalaxmi Temple is the holy place of worship of the Hindus. The original deity lies in a small box in the rear wall of the temple, facing the main idol of the modern Mahalaxmi Temple. Architectured by Charles Correa, Kala Academy fascinates the visitors by its use of structure and space. Kala Academy has an auditorium named after Dinanath Mangeshkar, Lata Mangeshkar's father and two mini theatres for workshops. There are also an open air theatre, a music library, a recording studio, art gallery, exhibition halls, practice rooms and several other rooms. The academy organizes cultural festivals throughout the year for promoting local musical and dramatic talents. Check out if anything interesting is going on in here. A visit here could very well be a high point during your visit to Goa. On the riverfront road, you will come across some of the popular sights of Panaji. The Panaji Jetty is the place where you will find small crafts like barges, yachts and trawlers. Next is the Abbe Faria statue, the man behind the Pinto Revolt of 1787. The statue depicts Abbe Faria hypnotizing a woman. Panaji's oldest surviving building, Idalcao Palace is located next to the Abbe Faria statue. Originally built by Sultan Adil Shah of Bijapur, the palace underwent total change to suit the requirements of the Portuguese Viceroy's Palace in 1615. The Viceroy's Palace was still there in Idalcao Palace up to 1759. In 1843, the Secretariat of the Portuguese Govt was shifted over here and now it is functional as passport office of the Govt of India. Situated opposite the Idalcao Palace, the Mhamai Kamat House is the ancestral home of the Raghvendra Mhamai Kamat, who constructed the Mahalaxmi Temple. Immaculate Conception Church is the main church of the Panaji town. The imposing church that dates back to the 16th century is well-known for its spectacular double staircase built in 1870. Immaculate Conception Church has the Mannerist facade of most old churches in Goa and it has twin towers and a central gable which houses the main bell. Every year, on December 8, a feast is held here. Before the feast, novenas are held followed by dazzling fireworks. Panaji's heritage area Fontainhas is located west of the Ourem River. With narrow winding streets, old buildings, shuttered windows and small overhanging balconies, Fontainhas offer an atmosphere of Portuguese era. Confeitaria 31 de Janueiro, one of the Goa's oldest bakeries is situated in Fontainhas. Step inside to get a taste of colonial Goa at tea time or try the Pinagre, Bebinca, Doce and Bolinas. St. Sebastian Chapel stands in Fontainhas at the end of a beautiful street. It was built in 1880 and is known for a number of striking features. St. Sebastian Chapel is renowned for its crucifix which once hung in the Palace of Inquisition in Old Goa. The crucifix depicts Jesus Christ with his head erect and his eyes wide open. Panaji Museum is a modern and well-maintained museum. The museum has an archive of photography, painting and sculpture brought from Goa and all over India. Panaji Museum is open Monday to Friday from 9 am to 1 pm and 2 pm to 5.30 pm. Your trip to Panaji is incomplete without a ride on Goa Tourism's boat, Santa Monica. The cruise boat will take you either east to see the Chorao island or west to view the sunset. Go on an early morning cruise and grab a front seat to watch the magnificent banks of Mandovi river. While you cruise through the river enjoy the music of live band. If you are visiting Goa during Christmas, then be assured that you are going to have some enormously enjoyable moments aboard. This is because during Christmas, Panaji's entire riverfront is lit with fairy lights. It makes you feel as if the illumination all over is magical and intend to bring an unprecedented joy, specially in your heart. Xavier Institute of Research : Drive over the Mandove Bridge to reach Porvorim where Xavier Institute of Research stands. The Institute has a rich collection of over 26,000 books, ancient tomes, theses, journals, and an art gallery with rare paintings of 17th century. The Xavier Institute is open from 9.30 am to 1 pm and 2-5 pm all weekdays except Sunday. A little further down the road from the Xavier Institute the road bifurcates, take left turn to reach the quiet Bardez village of Salvador do Mundo. Here you will see the three-storeyed boat-shaped buildings of Goa Museum built on a teriffic island. The museum has the collections of models and panels of old Goan houses and ancient household artefacts. Set on the western circuit of Chorao Island, the Bird Sanctuary is surrounded by the waters of Mapusa and Mandovi river. The Bird Sanctuary of migratory birds spreads over 1.78 sq. km area of mangrove forests. Located 9 kms south west of Panaji, Dona Paula is a popular stop for sightseeing tours. The beach divides the Zuari and Mandovi estuaries and provides spectacular views of Mormugao town. The Cabo Raj Bhawan, official residence of the Governor of Goa is situated on the westernmost tip of Dona Paula beach. 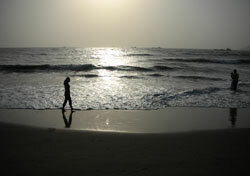 Miramar Beach is another beach near Panaji, just one kilometre away from Dona Paula. Shopping in Panaji is an exciting affair. Untouched by the advances in technology and development, you can find a range of handicrafts and traditional Goan items. For branded shopping, head to colourful MG Road and the 18th June markets. You can shop branded clothes - cottons, denims, salwar kameezs, kids wear and sarees, shoes - leather, sport shoes, rainwear and jewellery in these markets. In these markets you will also find the liquor and wine shops. Browse through the Panaji Corporation market where you will get everything, from local and exotic fruit and vegetable to fresh and dried fish. People come here to buy tiger prawns, mackerel, kingfish, squid, crabs, pomfret, mussels and oysters. The market also has stalls selling cloths, bags, shoes, electronic gadgets, spices, flowers and sweets. In Panaji you will find a number of good hotels that will suit your budget. Make your selection from a wide range of hotels in Panaji that include five star and three star hotels, inns, guest houses and lodges. 5 Star Hotels : Goa Marriott Resort, The Majestic Goa. 3 Star Hotels : Hotel Golden Goa, Hotel Mandovi. 2 Star Hotel : Hotel Delmon, Hotel Nova Goa. By Air : Nearest airport is located at Dabolim, at a distance of 32 kms. Indian Airlines and private operators offer flights for the major cities of India like Delhi, Mumbai and Bangalore. From the airport you have to take the road journey to reach Panaji. By Train : Vasco-da-Gama (35 kms) is the nearest major rail head. Trains for the important towns and cities of India are available from Vasco-da-Gama. To get to Vasco-da-Gama from Panaji you can either go via the Dona Paula ferry or the Agassaim-Cortalim ferry. By Bus : There are several private companies which offer luxury, air-conditioned buses from Panaji to Mumbai. Goa, Maharashtra and Karnataka State Transport Corporation operate buses for Panaji. Daily buses are available from Panaji to Mumbai, Pune, Bangalore and Mangalore. The Karnataka State Road Transport Corporation (KSRTC) also run buses from Panaji to Bijapur, Badami and Shimoga. Local Trasport : One of the joys of the travelling around Panaji are the ferries across the rivers. Ferries ply between Panjim and Betim, Ribander and Chorai Island from 7 am to 7 pm.